The Acoustimeter is a user-friendly accurate RF measurement instrument which provides LED light and LCD text displaying peak, peak hold, and average levels of radio frequency electromagnetic fields, covering the spectrum from TETRA all the way up to and beyond the 5.6 GHz WiFi and WiMax frequencies. It has a digital readout which is sensitive 0.02 V/m - 6.00 V/m and a sound output enabling you to hear the signal modulation. These features make the instrument the most useful one available to even those with severe electrosensitivity. The Acoustimeter has been designed to enable you to make a quick and informed judgement regarding the level and nature of microwave signals in your environment. It is a broadband instrument that accurately measures the totality of the radiation in the range 200 MHz to about 8000 MHz (8 GHz), which covers the frequencies used by most modern communication systems encountered in our everyday environment. The Acoustimeter was designed using the experience gained from many years of practical RF and microwave measurements. The readings are shown on both an LCD display and two series of graduated LED lights. The LEDs update rapidly, and allow you to quickly gauge the levels in an area and find any hot-spots. The LCD display offers high accuracy with a lower update speed, giving you time to take note of the readings. It also has a speaker (and audio output socket for headphones or to feed to an audio recorder), allowing you to determine, with a small amount of practice, what type of device is creating the levels that are present. The sounds made by different transmitters can change with time, so these are meant as a rough guide only. If you are subject to a number of sources of RF, the sounds may intermingle and be less easily identified. 2 year mfr warranty. Provides LED light and LCD text displaying peak, peak hold, and average levels of radio frequency electromagnetic fields, covering the spectrum from TETRA all the way up to and beyond the 5.6 GHz WiFi and WiMax frequencies. 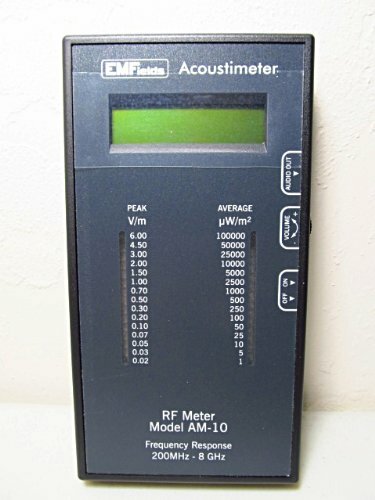 If you have any questions about this product by Acoustimeter RF Meter Model AM-10, contact us by completing and submitting the form below. If you are looking for a specif part number, please include it with your message.